A market professional may want to accumulate a large position in a stock that is trending strongly; either for his own account or for a major client. How does he/she do this? If he starts placing buy orders in the pool, he will chase the stock up sky high, without being able to build a big enough line. The golden rule is: buy into weakness. The professional bides his time, waiting for the stock to consolidate or start a short-term correction. He knows that trading will be quiet during this phase: buyers lose interest for a while and look elsewhere. He also knows where most traders have their stops. In a strong-trending stocks, most traders will seek to lock in profits by placing their stops below the previous short-term (or intermediate) low. In a consolidation they tend to move their stops up to just below the base. For further details see Adjusting Stop Levels. 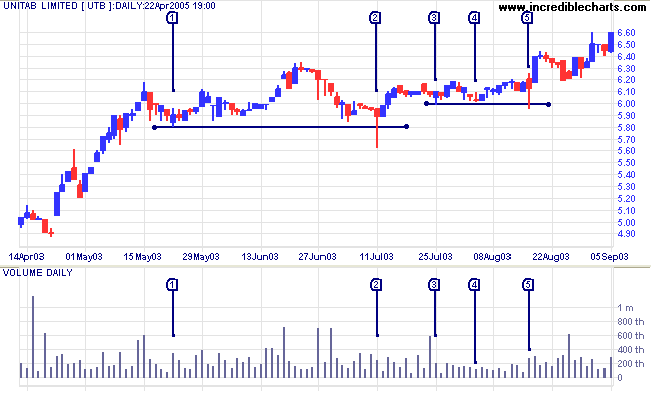 A few well-placed sell orders on a quiet day will drive the stock below its' support level. Stops are triggered, sending a flood of sell orders into the market. Everyone takes fright while our market professional steps forward and scoops the pool; buying in the face of the correction. Selling dries up when the stops are filled and the stock soon recovers back into its normal trading range. Everything returns to normal; except that our market professional now has a sizeable parcel of stock, accumulated at bargain-basement prices; and a group of punters curse their luck while the stock soars into the stratosphere. 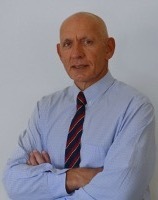 Unitab Limited holds various gambling monopolies in Australia. 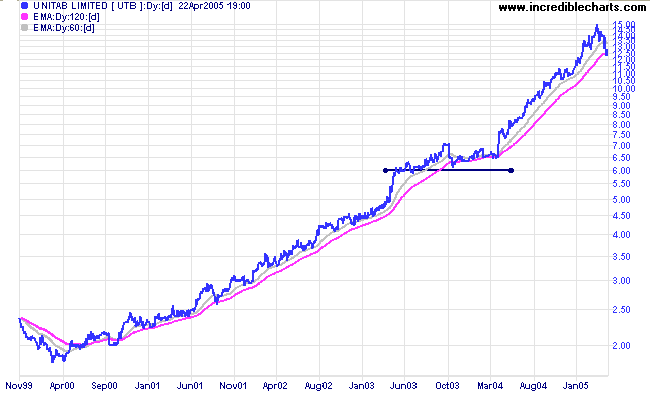 The stock had been in a strong up-trend for several years before a consolidation around $6.00. After a brief low (at  on the chart below) the stock consolidated for 2 months around the $6.00 mark before stops were triggered at  by a fall below $5.80. There was a flurry of selling, quickly scooped up by the market pros, with the stock retreating back above the support level before the close. A further support level was established at $6.00, by lows at  and , before another shakeout at .